“You come at the king, you best not miss.” Aside from being an iconic quote from one of the best characters seen on television to date, that’s evergreen life advice. 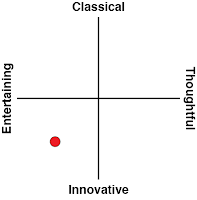 It’s especially useful for anyone in a creative industry. We all have our influences and every piece of art is derivative to some extent, but the closer you ape something popular, the harder it becomes for your work to stand alone. 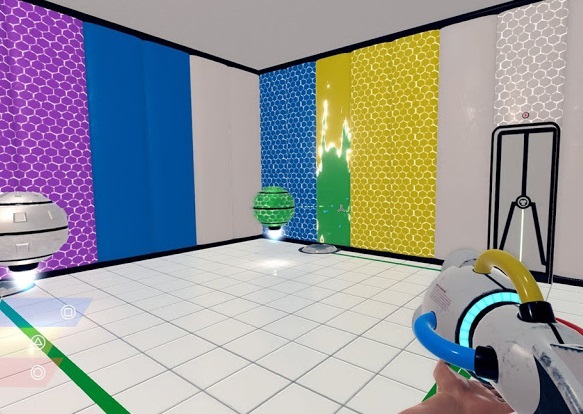 ChromaGun is a good gun-based first-person puzzle game, but in trying so hard to be like Portal – not just in its mechanics and approach to puzzle design, but in tone, presentation, and setting as well – that it becomes almost impossible to not make the comparison. When you come at the king, you best not miss. 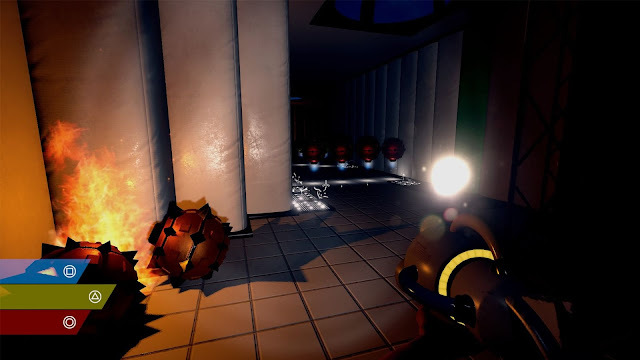 To wit: ChromaGun takes place in a strange, eerily pristine technological testing facility, puts an experimental gun in your hand, and then asks you to move from room to room solving puzzles with said gun. 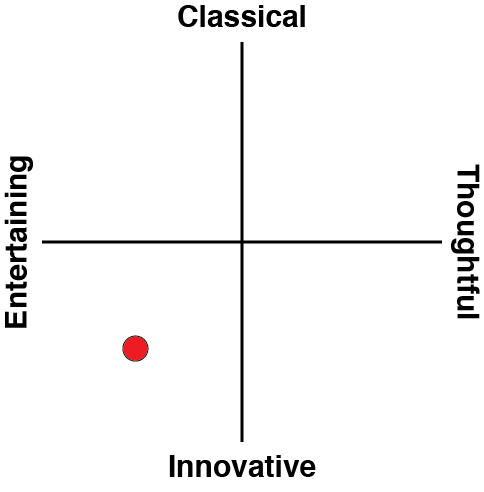 All the while, an AI watches your every move and comments on your successes and failures with sarcasm and passive aggressiveness veiled in an overly-friendly tone. That approach worked for Portal, in part because the writing and Ellen McLain’s performance as GlaDOS were impeccable, and in part because it was something very unusual and new. ChromaGun has none of that going for it, so the whole narrative framing just falls flat. The dialogue is unfunny at best and cringeworthy at worst, further hampered by inconsistent delivery and a general lack of comedic timing. Every time the creepy AI pipes up, it forces that comparison with Portal, and every time that happens Portal comes out on top. It’s a shame, because when it’s allowed to just be its own thing, ChromaGun is a smart and well-designed puzzler. The basic idea is very simple: you have a gun that can shoot primary-coloured paint, worker drones are attracted to walls of the same colour as themselves, and getting a drone (or drones) to stand on a switch opens a door. Therefore, with your ChromaGun, the aim is to paint walls to match the drones you want to move, paint drones to match the walls you want them to go to. Sounds easy? It is, at first. You start with only one colour, and simple puzzles get you acquainted with the basic idea of the game. With single paintable wall panel right behind a switch and a drone of the same colour as your only ammunition, the answer is clear: paint the wall, and watch the drone move onto the switch. But each level adds new quirks, like the need to paint multiple walls to position a drone just right, corners that break line-of-sight between a drone and a same-coloured wall, and drones that follow and attack you unless there’s a matching panel to distract them. Then it throws more colours into the mix. With a full set of primary colours in your gun, you can also create secondary colours, which come with their own sets of challenges. You can paint a wall yellow and then add blue to make green, but it can never go back to being yellow after that; it’s not just about painting the right walls the right colours, but using the right colours in the right order. Then you get even more things to deal with, like drone-destroying traps and special force fields that let paint through just fine but not you or any drones. As all these different elements build up, the puzzles get fiendish, but because the game is so good at introducing new mechanics one at a time and instructing you on their use through puzzle design itself rather than tutorials, it rarely gets frustrating. To bring it back to the Portal comparison, ChromaGun’s puzzle design is brilliant for the same reasons as that of Portal, but without simply mimicking its mechanics. The puzzles themselves are very different, but both games are excellent at starting simple, slowly building up complexity piece by piece, and putting you in a position to learn by doing. 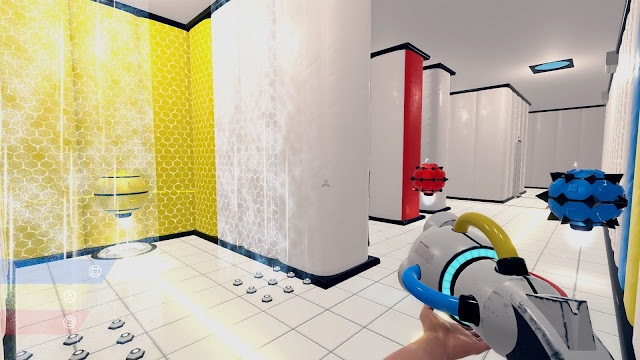 Were that the extent of Portal’s influence, it would be a very positive comparison to make, because ChromaGun has its own unique twist on the ideas that made Portal’s puzzles so smart. But in trying to be a new Portal not just mechanically but in tone, style, presentation, humour, and narrative as well, ChromaGun sets itself up for a comparison that could never end well for it. It constantly reminds you that you’re not playing Portal by highlighting all the ways that it falls short of Valve’s beloved puzzler. ChromaGun came at the king, and it missed.